Marble has been used for everything from kitchen counters to sculpture. It's an architectural favorite because of its ability to be carved and polished. The characteristic streaks of color vary immensely, so no two pieces look the same. 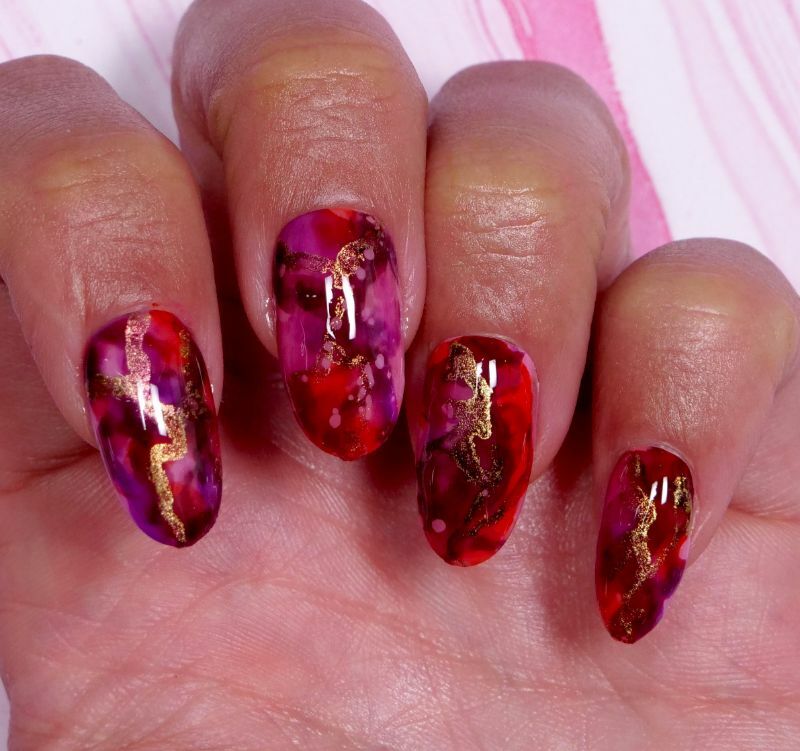 If you're feeling the need to convey a unique vibe while showcasing your love of color, then this marbled nail tutorial makes an impressive choice. To achieve the perfect marbled design, begin with a plain pink base coat. The alcohol inks used to achieve this effect go on like water and swirl together without having any noticeable texture. Avoid muddying up the colors by cleaning your brush frequently between colors. Wiping it on a paper towel, then into the alcohol will prevent the colors from becoming murky. 1. Apply two coats of pink gel polish to the nails, curing them between coats with the UV or LED lamp. 3. 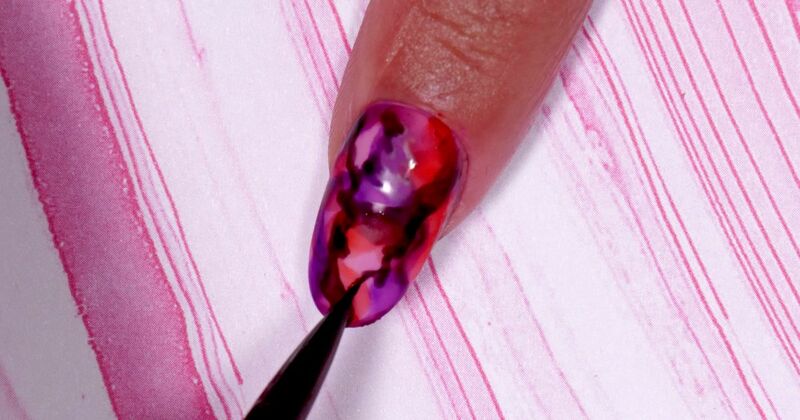 Apply purple alcohol ink to the nails in a wavy pattern, using a blending brush pen. 4. Pour a small amount of isopropyl alcohol into a glass dish, then dip the fine detail brush into it. Lightly sweep the brush over the purple design. The alcohol will make the ink more watery, so the additional colors will blend more seamlessly. 5. Wipe the brush on a paper towel to remove any excess ink before proceeding. 6. Dip the brush into the alcohol once more, then apply a single drop of orange ink to a clean glass plate. Dip the brush into the ink, then apply the color to the nails as well. 7. Clean the brush again as in step five, then repeat step six using black ink. 8. Clean the brush once more, then apply gold ink to the nails. Cure the ink with the lamp. 9. Seal the final design with a layer of no-wipe gel top coat, then cure the gel with the lamp. Enjoy the compliments, and please share this nail design tutorial on Facebook.